You want to understand how Google’s RankBrain affects your website’s search rankings. There’s no shortage of information. If anything, there’s too much. And, often, what one expert says contradicts what another expert says. You just need an overview to help you to evaluate what experts tell you. This article is for you. If you want a deeper treatment more specific to just Google, see Dr. Meyers’ original article, which was written for SEO professionals. Dr. Meyers article was my jumping off point. But while reading and researching his article, I discovered that Microsoft’s Bing search engine does many of the same things that Google’s does. In what follows, I’ve incorporated some results about the less widely covered Bing engine. 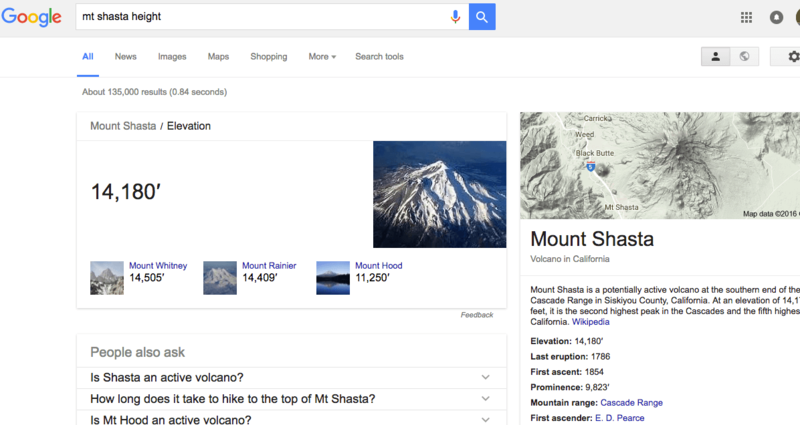 On May 15, 2013, Google announced conversational search for desktop. A few months later, Google’s core engine received a major update largely related to conversational search. That development significantly changed the way keywords work, and it all relates in the end to deep learning. What Can Conversational Search Do? 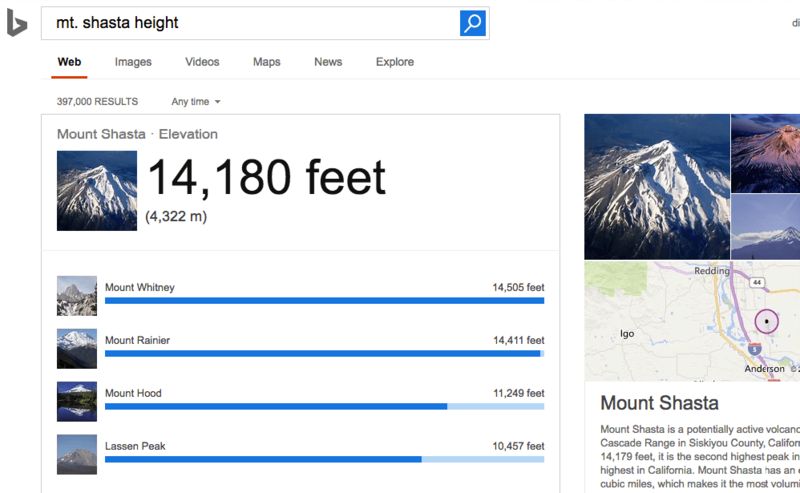 What can Google and Bing’s new search approaches do that they couldn’t do before? As an example, let’s say you want to know the height of Mt. Shasta. You could say or (type), “What is the height of Mt. Shasta?” or “how tall is mt. shasta” or “shasta height meters” or “shasta altitude” or “what is the elevation of shasta in meters” or “mt shasta elevation”. All of these will give you the same result, except that some will be in meters and some in feet, as you specify. Google and Bing’s natural language algorithms evaluate your query in a more fluid and… er… human way. Not long ago, search engines couldn’t evaluate plurals. That’s not a problem anymore: “mouse” and “mice” can be used interchangeably, as can Dr. Myers’ examples “scarf” and “scarves”. Even beyond that, a search will yield results based on a word stem. Dr. Meyers example was a search for “ballroom dancer” which produced results for “dances”, “dance”, and “dancing”. And yet further, synonyms are often included in results whether explicitly requested or not. Dr. Meyers’ example “discount airfare” yielded “airfare deals”, “discount tickets”, and “cheapest flights”. And, like Google, Bing finds and highlights other variations. A search for “Mt. Shasta” or “Mount Shasta” will yield the same results. “Doctor Gutman”, “Dr. Gutman”, and “Gutman MD” will yield the same results. Of course, if you’re looking for a Ph.D. named “Gutman” instead of an M.D., you might have to specify, depending on many factors. If one acronym covers many cases, you can get ambiguous results. But acronyms generally work well for widely used or popular acronyms. You can often search the expanded acronym and get the acronym: “Hypertext Markup Language” and “HTML” are interchangeable in search. Dr. Meyers gives an interesting acronym example: “NJ DMV” or “NJ Department of Motor Vehicles”. Even though the New Jersey agency that regulates motor vehicles is the “MVC” or the “Motor Vehicle Commission” a search for “DMV” or its expansion will yield results including the NJ MVC. This also works in Bing, by the way. Search has become far more sophisticated all around. Somebody might think that these examples are cherrypicked. But I notice these types of results for nearly every search I make, whether using Google or Bing. Dr. Meyers took it a step farther: he ran an analysis on page one results for 10,000 keywords. The result: “only 57% of results had the search phrase in both the title and snippet”. Dr. Meyers draws the conclusion that these results indicate that the Google algorithm is learning. I suggest that the same results indicate that the Bing algorithm is also learning. Is it “The Machine” vs. “Samaritan”? The entire post so far might seem like a digression from how Google’s RankBrain affects SEO. But we needed to see what search engines can do without BrainRank in order to see what BrainRank adds. Another digression is necessary: since Google and Bing use deep learning, some general information about deep learning would be useful. Dr. Meyers uses the abstract definition of Deep Learning in Wikipedia. He also goes on to discuss neural networks, which are one of the primary models for deep learning. For more about that, see his article. Deep-learning software attempts to mimic the activity in layers of neurons in the neocortex, the wrinkly 80 percent of the brain where thinking occurs. The software learns, in a very real sense, to recognize patterns in digital representations of sounds, images, and other data. Because this is an article about how keyword research and usage has changed, I’m not going to go into depth about deep learning, much as it interests me. For more information about deep learning and search engines, these sources will get you started: the Deep Learning article mentioned above, Google’s free Deep Learning course on Udacity, a Bloomberg article “Google Turning Its Lucrative Web Search Over to AI Machines“, and Joseph Sirosh’s ‘From “A PC on every desktop” to “Deep Learning in every software”‘ on the Microsoft Azure blog. The days of keyword stuffing are long past. It is also no longer necessary to include an instance of every plural and form to cover the possible search phrases for your subject. Also gone are the days when you would be advised to repeat the same exact keyword over and over in order to bring the frequency up. These practices led to some pretty bad content. How can we change our approach to take advantage of more insightful search engines? The short answer is that you can’t really change things very much yet. You can, of course, use variations of words with confidence, while in the past you couldn’t. But search engines are still machines and they still read and think like machines. Until they actually mimic human understanding, they will limit what you can do effectively. So, no, you still can’t just write for humans and expect that search engines will rank you at the top. To create a meaningful keyword strategy will require some in-depth keyword research for the article, page, and website you’re working on. There are many tools available. The truly free yet productive tools are Googlee AdWords Keyword Planner and Bing Webmaster Keyword Research. With a free account, you can research 5 keywords per day with Moz’s Keyword Explorer. Check out “Keyword Research Tools: Which Ones to Use” by Marieke van de Rakt at Yoast. There is no silver bullet. If you’re serious about using keyword research to drive traffic to your blog or website, you might want to consult a professional. But that’s a whole other subject.